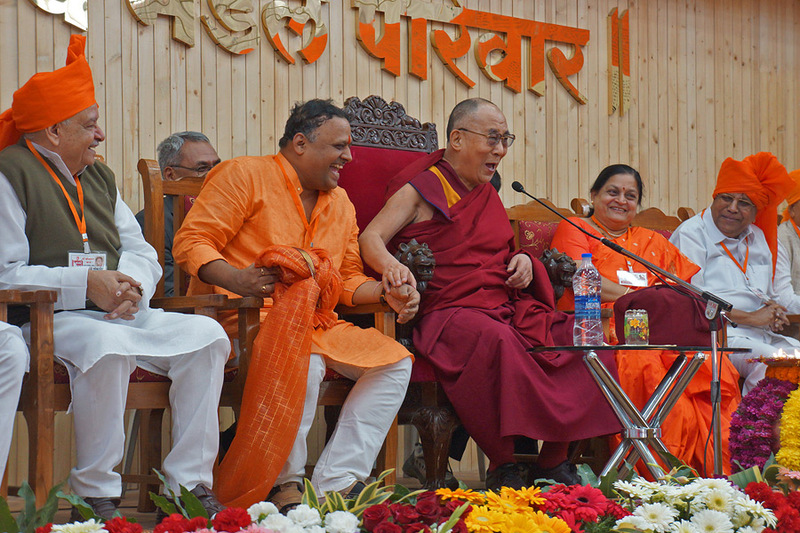 (TibetanReview.net, Jan02, 2015) – Tibet’s exiled spiritual leader, the Dalai Lama, on Dec 31 inaugurated the new building of a charitable organization working in the field of human resource development in the city of Pune, Maharashtra state of India. He was invited by Avinash Dharmadhikari, the Founder Director of the Chanakya Mandal Pariwar (CMP), a Network Organization and Public Charitable Trust working in the fields of Career Guidance, Competitive Exam Training, Entrepreneurship Building and Personality Development. He called on the gathering to combine ancient Indian values with modern education, and on India to extend itself to influence the world, so as to lead by its example of pluralism, tolerance and ahimsa. He said that each one of the 7 billion human beings on this earth had a responsibility to work for peace in the world, that “if one of us maintains peace of mind it will have a ripple effect on our family and friends”. The Dalai Lama said he was impressed by the CMP’s dedication to practical education. He said what the world needed today was a source of secular ethics on which people act voluntarily and added that education should be geared towards being that source.